Determined not to repeat the evacuation mistakes that surrounded the devastating Hurricane Katrina in 2005, evacuation was swift and determined in the wake of news that Gustav and Ike were hurtling towards the Southern USA. Not only was the prevention and relief effort more co-ordinated for human victims, but pets had a better time of it too. The Houston Chronicle reports that organisations such as the Austin Humane Society helped evacuees leave safely by taking custody of their animals until the owners are safely back at home. Many people were not allowed to take pets onto evacuation buses last time around, leading to many deaths of both animals and people who would not leave their companions. The Pets Evacuation and Transportation Standards Act was passed by Congress a year after Katrina to ensure pets were better protected; Texas followed with a similar law last year. You can read more about the steps that shelters have taken to ensure pet safety by following the link to the full article. 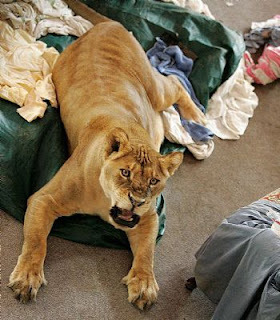 In the meantime, somewhat bigger animals have been giving Ike evacuees cause for concern as a tiger and a lion escaped from an exotic animal centre in hard-hit Crystal Beach. Shackle the lion was safely contained and spent the night comfortably dozing in a church with his owner, but the tiger is still on the loose... and apparently 'hungry'. Here's hoping that he's safely captured soon, for his own safety and that of the humans and animals around him.